The main purpose of siimvi is showing images fit-to-screen with easy toggle to show them in original size (1:1), but not to be able to adjust any image settings. Use a full image manipulation program for that. siimvi is mouse centric, meaning, that all features are easily accessable via mouse buttons. Right-clicking into the image will open a small menu with the programs options. Left-clicking into the image toggles between showing full screen (only parts fitting onto the current screen size or shown) and maximized to screen size (scaled down to fit the screen). Clicking the mouse wheel/middle button will show the image information. Exif information are supported, if the appropriate libraries are installed. 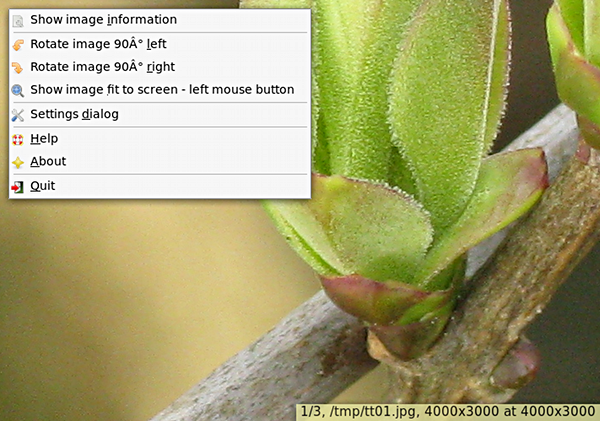 siimvi supports exif information to show images in the right orientation. Adjusting images via this option can be de-select in the settings dialog as well. (lib)Exiv2 must be installed to auto-enable exif support. Currently only exif 'image' and 'photo' tags and somewhat 'Canon makernote' tags are supported. More options can be accessed via the menu by right-clicking into the image. The program is released under GPL2 or later. - exiv2, for compilation, not when running (but of course, then exif information cannot be shown). - ExifTool by Phil Harvey, not for compilation, if you want to see exif image information. Whether the image information, file name and/or size, should be shown in the lower right of the screen can be configured in the settings dialog, as well as the time for how long it/they are shown after loading the image. * pre-compiled arch package updated - required as exiv2 was updated. * pre-compiled arch package updated - required as exiftool was updated. * fixed: sort: ignore case (showing an image off many in a dir), should result in more expected behaviour with human like file managers like xfe or thunar.